Determined to put a stop to Hideo's grim plans, Emika and the Phoenix Riders band together, only to find a new threat lurking on the neo Emika Chen barely made it out of the Warcross Championships alive. Now that she knows the truth behind Hideo's new NeuroLink algorithm, she can no longer trust the one person she's always looked up to, who she once thought was on her side. To ask other readers questions about Wildcard, please sign up. DO YOU KNOW HOW INSANE I AM GOING. WHEN IS THIS COMING OUT?????????? THAT ENDING. HOLY CRAP. When I die, I want Marie Lu to lower me into my grave so she can let me down one last time. Finishing this book was a personal achievement but you can’t really brag about that at dinner parties. It’s just…the kind of book you read, and it fills you with the wrong things: you use a lot of energy to get through each chapter, and in the end, you feel emptier and less comfortable than ever. I loved Warcross, and it floored me to read this book and experience such a sudden shift—I feel as though a scri When I die, I want Marie Lu to lower me into my grave so she can let me down one last time. I loved Warcross, and it floored me to read this book and experience such a sudden shift—I feel as though a script had been shuffled and I’d been handed the wrong pages. The utter wrongness of it, the way it won’t fit in my head, keeps coming back to me again and again, as if I’ve only just read it. Honestly, there has to be some fundamental law of the universe against sequels that don’t live up to their prequels, and if there isn't, I want it written somewhere that I am conscientiously objecting. The concept and execution in this book are so divorced as to bear no relation to one another. But the biggest problem with the story was the pacing. It takes a long time for the plot to really kick in, trusting on the reader to be invested enough in the possibilities of the story to make it there. Unfortunately, there isn’t really an infinite store of patience to be had, and every page lasts for what is likely only a minute but seems to drag across several years. Eventually, the boredom quickly swallowed my enthusiasm so that what was left simply felt like utter indifference. I must’ve really liked Emika Chen at some point—but I can no longer accurately place her in my head. She gets just enough attention to make it clear she’s important, but that importance never really goes anywhere. We’re expected to believe that she is the fulcrum around which the fate of everyone turns, yet now that I think about it, days later, with the clarity of thought necessary to step back from my disappointment and truly look at what she has done, I realize that her contribution to the narrative racks up to a sum of exactly 0. The people actively attempting to see the pathway out of their problem and into a solution is everyone else but her. Same thing for Hideo: he only haunts the edges of the story but never gets quite enough focus to mean much. I was so artfully uninterested in whatever outcome they bring about until we reach the ending and I realize with enormous indignation that they get to collect all the benefits without having done any of the work. Seriously, what the hell did they actually do? Don’t even get me started on Hideo being portrayed as some sort of Tragic Figure™️ who’s only ever wanted to find his brother, and not addressing the whole, you know, “he created an algorithm that controlled and resulted in the literal deaths of people” thing? I guess rich people get away with actual crime in fiction too. I was also disappointed that at one point, what seemed like the lead-up to a thrilling Warcross game didn’t materialize at all—actually, there is a huge shortage of Warcross in this book. I guess the book was less interested in that aspect than I was, and cast it off relatively quickly in favor of pursuing a less enjoyable narrative cobbled together with few plot twists that—when taken all together—didn't quite reach the high water mark set by the first novel, and building up to an ending and denouement that somehow skirt the edge of taste to be ludicrous and not the least bit satisfying. It’s really a sad thought, but there’s a saving grace: Emika’s team. I was so excited to know them and know the gestalt of who they are, and fortunately for me, we do! Learning about Tremaine and Roshan’s backstory, Hammie’s family, Hammie and Asher’s relationship was about the only thing that buoyed my spirits. Seriously. Has anyone else ever been so disappointed by their most anticipated book that they've had the sudden urge to just disappear to another country, erase their history, re-write their identity, and become a mysterious figure who has never been photographed but occasionally appears in paintings done by unknown artists? Because that’s how I feel about this book in general. I like sweets. You all know this. Ice cream is one of my favorite sweets. I do not take my ice cream lightly. When I get ice cream, you can bet that I'm gonna savor it. Well the other day, I was at a restaurant reading Wildcard and I ordered ice cream. It arrived and then it melted. Why? Because I WAS SO IMMERSED IN THIS BOOK THAT I COULDN'T THINK ABOUT ANYTHING ELSE BECAUSE THAT'S HOW GOOD IT IS. Marie did an amazing job writing this conclusion to a fantastic duology. The character development I like sweets. You all know this. Ice cream is one of my favorite sweets. I do not take my ice cream lightly. When I get ice cream, you can bet that I'm gonna savor it. Marie did an amazing job writing this conclusion to a fantastic duology. The character development is remarkable, the heartbreaking bits are soul-crushing, the happy bits made me grin like an idiot. There's one specific villain in here who I wanted to kick in the face, and the entire thing was so cleverly plotted. It is a WONDERFUL book and I highly recommend that everyone read it. That's the difference between the real and the virtual. Reality is where you can lose the ones you love. Reality is the place where you can feel the cracks in your heart. 2 1/2 stars. Wow, I'm really not sure how to rate this book. I think it was pretty poorly-paced with weak characters, but I also liked some of the exciting twists and turns Lu took. My experience with this book actually makes me wonder if I was in a really good mood when I read Warcross. Emika is so bland. Was she always this bland? I'm not sure. All I know is that she had absolutely no agency or independent thought in Wildcard. This book sees her being used as a pawn by everyone - her motivations seem always tied into what Hideo or the Blackcoats want. Emika responds to events as they occur, seemingly without any drive or feelings of her own. As someone who really likes to connect with the narrator or protagonist, it was a little difficult to stay engaged at times. There were two things that drove the plot of Warcross for me and kept the pages turning: 1) The action of the Warcross game itself, and 2) the dynamic between the Phoenix Riders. The first of those is, of course, completely absent in Wildcard, but there's also a disappointing lack of the second. The Phoenix Riders don't feature for a huge chunk of this book, with the focus instead being on Hideo and Zero (and, I guess, Emika, except it feels like she does nothing). The Zero aspect of the story is fairly interesting, and I'm glad we got to see what happened to him. In fact, discovering his story is what about 75% of this book consists of. The last 25%, however, felt soooo long. I think these later chapters were supposed to be a concentrated stream of action leading to a dramatic climax, but it feels like it goes on forever, dragging out an ending that already seems inevitable. Okay, and I'm sorry to keep reiterating this point, but what exactly does Emika do in this book? She literally acts as a mouthpiece and a go-between. She witnesses things happening to other characters, and she seems to have very little opinion on some of the morality issues Lu brings up. I swear Wildcard could just as easily have been told by an omniscient narrator and little would change. Perhaps my problem with this sequel is that the exciting action and the diverse Phoenix Riders in Warcross disguised problems I might otherwise have had with it. Once you take those things away, Emika Chen struggles to carry the story. CW: Suicide (nothing graphic); drug abuse. Despite my excitement for the sequel to one of my favorite books of 2017, I’m very let down by Wildcard. It did not reach the potential I felt it could have. I’m stuck between 2.5 and 3 stars because my grand disappointment feels so severe, but I think 3 stars is the most fair rating. Let me preface by saying the great moments of Wildcard were GREAT. The scenes depicting games of Warcross were FLAWLESSLY executed in terms of pace, structure, and choreography. Ther Despite my excitement for the sequel to one of my favorite books of 2017, I’m very let down by Wildcard. It did not reach the potential I felt it could have. I’m stuck between 2.5 and 3 stars because my grand disappointment feels so severe, but I think 3 stars is the most fair rating. Let me preface by saying the great moments of Wildcard were GREAT. The scenes depicting games of Warcross were FLAWLESSLY executed in terms of pace, structure, and choreography. There were absolutely scenes that reminded me why I fell in love with the story of Warcross in the first place. Other than that, this book was just . . . underwhelming. I felt the high intensity story of Warcross was bogged down by filler scenes and LOTS of dialogue. When attempting to reflect on the entirety of the plot, it feels as if not much happened until the end. I understand the book takes place in such a short span of time but I almost would have preferred to have TOO much going on as compared to too little. Combined with a very slow pace, the book dragged in a way I never expected it to. To be frank, I truly feel like the complete sequel was unnecessary and I would have preferred Warcross to be longer and complete the story as a standalone. One of the elements I loved in Warcross were the characters. I loved the relationships and dynamic against this refreshing cast, but it was pretty lacking in book two. Emika is a very passive character in Warcross, responding to how others act, yet not often acting herself. The Phoenix Riders as a group play a minimal part in the story and did not possesses the same intrigue I felt in book one. 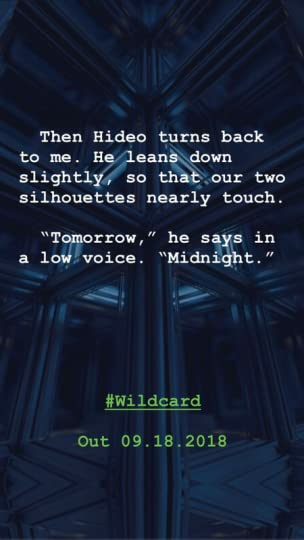 Hideo is more of a “figure” we talk about/hear about in Wildcard rather than an active character as well. Zero is the one character who actually receives some attention (and was done very well - his story line was one of the only redeeming plot lines of the book), but it wasn’t able to hold up the entirety of the story. I am pleased with the introduction of ONE new character and the exploration of a few others, but other than that, the characters were extremely weak compared to book one. I craved so much more interaction and development than what we actually got. 1. Own and read every single book Marie Lu writes. “And that's when I realize that, at the end, we'd all wish for the same thing. Just a little more time." Before I get into my review of this book I figured I’d remind you about what happened in the last book in case you don’t remember, if you do just skip the next paragraph. Hideo Tanaka created a virtual reality game called Warcross that took the world by storm. Emika Chen hacked the game, but unfortunately was revealed to the world as her hack’s invisibility dropped for a second. Instead of be “And that's when I realize that, at the end, we'd all wish for the same thing. Just a little more time." Hideo Tanaka created a virtual reality game called Warcross that took the world by storm. Emika Chen hacked the game, but unfortunately was revealed to the world as her hack’s invisibility dropped for a second. Instead of being imprisoned, Hideo offers Emika a job to find out who's trying to sabotage his work. Emika Chen is chosen as the wildcard of the Phoenix Riders and tries to find the culprit while playing the game. Quick recap of the team: Asher is the captain, Hammie is the Thief, Roshan is the Shield, and Emika is the architect. And side note, Tremaine is Roshan’s ex who left the Phoenix Riders a while ago. Emika finds out that a guy called Zero is the saboteur, and is probably Hideo’s long lost brother who was kidnapped when he was a child. Emika gets to know that Hideo's new NeuroLink lenses are going to be used to control the minds of just about everyone in the world in an attempt to put an end to all crime and bad intentions, Emika is shocked that the man she fell in love with could do such a thing. This book is nothing like the last one. Warcross was our introduction to this world, Emika Chen, and the underlying plot which was going to drive the second book. But this book, while being driven by that plotline, is so much more in terms of emotion, the past, and heartbreak. We see Asher, Hammie, and Roshan helping Emika figure out what she should do to put an end to Hideo’s algorithm. Emika is reluctant in joining Zero because his means and motive are unclear. In this book we definitely see a lot more of Zero and the people who help him, and they play a huge role in directing this story forward. Emika, the Phoenix Riders, Zero, and anyone who is not under Hideo’s control are only being able to do so because they still use the beta lenses and haven’t shifted to the new ones. But while they presently retain their freedom, it won't last for long unless they figure out how to destroy the algorithm before the final day of the Warcross closing ceremony because on that day the beta lenses too will be patched into the algorithm. Emika struggles with her feelings for Hideo and wants to convince him to put an end to his algorithm. Neither of them are over each other. Tremaine plays a slightly bigger role in this book than the last one and we find out why he left the Phoenix Riders. We learn a few new things about Roshan’s family and his past with Tremaine. And there's not much more to say that doesn’t spoil the book. The characters are amazing and are perfect for the roles they play in the story. 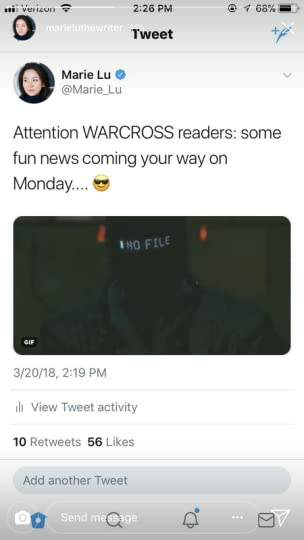 The plot moves forward steadily as each chapter reveals a little more information about the plot that we didn't already know from Warcross. Despite being spread out so evenly I must say chapter 20 has emotionally scarred me for life, that chapter is just too much to handle and everything just hits you ten times harder than you expected it too. Chapter 32 was pretty bad too but nothing beats 20. Wildcard moved forward in ways I didn't anticipate at all. When I finished Warcross I had pictured this book going in a certain direction, which was pretty obvious to anyone who read Warcross, but this blew my expectations out of the water and didn't fail to surprise me. The ending, especially, made me extremely happy because I felt like Marie Lu could have taken this story to much grey-er, sadder finish, but while every single word was jam packed with emotion the ending provides a ‘ and this world shall move on’ sort of feel which I loved. So far, I have read Marie Lu’s The Young Elites and loved it with all my heart and after reading these books I'm convinced she can do no wrong. 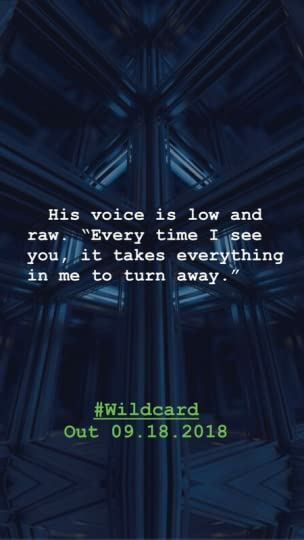 If you haven't read Wildcard yet I'm telling you that you have to read it. Its is a beautiful conclusion to a mindblowing world and I hope all of you enjoy it as much as I did. Just keep in mind that people can have ulterior motives, there's a lot of betrayal, and a few shocking revelations along the way. I give this book 5 stars and wouldn't change a single thing about it. I always forget this about myself: if I don’t love the characters of a series’ opening book, I should not read the sequel to said book. Even if I loved the ending. Even if I gave it the fairly solid rating 3 1/2. That is not how I work. Okay, so here’s a basic summary of this series: a premise about video games gets somewhat underused but in a fun way. None of the characters are particularly interesting, but I guess they’re compelling enough for a YA sci-fi. Marie Lu is a compulsively readable a I always forget this about myself: if I don’t love the characters of a series’ opening book, I should not read the sequel to said book. Even if I loved the ending. Even if I gave it the fairly solid rating 3 1/2. That is not how I work. Okay, so here’s a basic summary of this series: a premise about video games gets somewhat underused but in a fun way. None of the characters are particularly interesting, but I guess they’re compelling enough for a YA sci-fi. Marie Lu is a compulsively readable author and very easy to connect with. And then this book fucks up a perfectly good thing by removing any sort of agency from the main character, which is not a good way to make a narrative compelling and I, as someone who literally has a mention of my love for narrative agency in my Goodreads bio, am not pleased. When the world is murky, guide yourself with your own steady light. I read Warcross a year ago and omg that book was really good. It was action-packed and then the world, the technology, basically everything in Warcross was very good and it also hit a little bit close to home for me. I shed a few tears. Warcross was a great read for me. 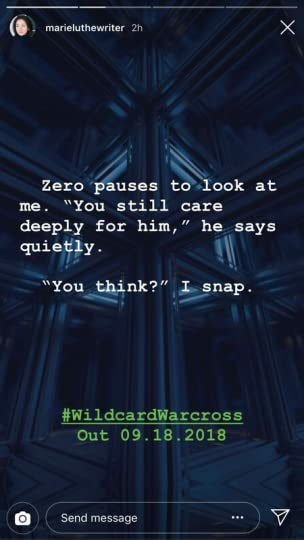 I swear I was so nervous and afraid when I read Wildcard because I really liked Warcross and I was afraid that this book would disappointed me because usually when I have high expectations of a book, then the book let me down later on. However, that did not happen to me with this book. Well, yeah the book was pretty slow at first but it never bored me and I always agreed with Emika. Like I don't even know how that's even possible that I agreed with her with every of her decisions. and there was this certain characters ( I'm not gonna tell you you who this character was because it would be a spoiler, if did tell you ) So this certain character caused me pain. Like so much pain, my eyes got really teary and I couldn't hold back my tears anymore and the only thing I wanted do was to hold this character and sob. and OH MY GOD this book! this book messed with my mind. There were moments where I just clutched my hair and read the book as fast as possible because I needed to know what's next and next and there was also a moment where I just felt like my heart was cracking slowly and my eyes were teary and I was so sad. This book made me feel a lot of emotions, happy, sad, relieved, anger and many more. Wow. I really liked this book. Wildcard was good but I also feel that it was not as good as Warcross. I mean Warcross was a pretty fun read for me but Wildcard was darker than what I expected and I liked it but ... I don't know there's something that I cannot explain because I don't even know it myself but for me Warcross was slightly better than Wildcard. But Wildcard was still good though. It was such good read for me. REVIEW TO COME ON SUNDAY! I'm currently reading this book, which I've been so excited and curious about since I finished reading Warcross. I AM SO READY TO FEEL ALL THE EMOTIONS. AHHHH. Please don't disappoint me book! Well, that was hella disappointing. After reading this book I had to and reread my Warcross review. Not because I didn't remember if I had liked the original novel. But because I didn't remember if I had always thought Emika to be so bland, stupid, and annoying. She was certainly all of these things in this book. In the previous book, Emika was an active and interesting character. In this one, she is little more than an observer while other people actually get things done. She asks a lot of questi Well, that was hella disappointing. In the previous book, Emika was an active and interesting character. In this one, she is little more than an observer while other people actually get things done. She asks a lot of questions and eavesdrops on a lot of conversations and watches a lot of videos of other people doing things. And that's pretty much it. She's more a narrator than an actual character and I couldn't stand it! I prefer character driven works to all others. This isn't one of those books. Emika is such a weak character in this one that it's actually kind of sad to read about. Her relationship with Hideo was kind of annoying as she completely let go of common sense for the sake of a guy she knew for a few weeks. She also behaves in extremely naive ways, trusting everyone and making dumb choices. All of that said, this book did have some good parts, namely, Emika's team. I liked that we got to see some depth to them and were able to watch their interactions. Honestly, they were more interesting than Emika, especially Tremaine and Roshan, and I would much rather read their stories instead. Another thing that this book did well was the mystery of Sasuke's disappearance. There was one plot twist in particular that made me put the book down and rethink everything I had just read. I have to give it to Marie Lu, that was certainly creative and clever. Sadly, that wasn't enough to make me love this. Overall, I think the book was kind of bland. It did have its amazingly clever moments and wonderful plot twists, but the characters themselves just couldn't seem to shine through. So, do I recommend it? Sure? If you absolutely loved Warcross then you might like this one. If Warcross just wasn't your thing, then maybe leave this one be. 2018 will forever be remembered as the year in which all my favorite authors let me down ... except for one. Who, sadly, is not Marie Lu. If you see me cry it’s not because of this book or that ending. Nope. What a ride. This conclusion was really different from the first book and I didn't mind at all. Welcome unpredictable, fast-paced and action-packed narrative, and welcome to my new attraction to Zero. He leans back against the wall, his arms crossed casually over his chest, one of his leg propped against the other. His face is no longer hidden behind a black helmet, and instead of his armor, he's wearing a simple black sweater and dark pants, his shoes polished to a shine. But his mannerisms are unmistakable to me. One side of his mouth tilts up in a smile. "Well, Emika," says Zero. "Welcome." This was his book, it's as simple as that. And all the twists and turns made me care about him more and more. I could say I like him almost as much as I like Hideo but I guess that's not possible, right? Hideo is... *sighs* Every time he was mentioned I fangirled. That yacht scene? The feels! And that's why I'm still single. I think back to the piercing gaze he’d given me during our last meeting. Underneath that had been fear, all along. “You told me you never wanted to see me again,” I manage to say. How will I cope without a new book in this series? How will I cope without Hideo? You know you’re trash for a character when you read a simple quote of them talking for about 3 seconds and you squeal like you’ve just been gifted a ticket to the Wizarding World of Harry Potter. ARE YOU HEARING ME SCREAM????????!!!! That moment when you see all these people with Wildcard arcs and you die a little inside. I admit I was confused at first and didn’t really like the cover. But as it happened with the Warcross one, after looking at it for a bit I’m seriously so happy about this cover! I guess both covers just are not my style but I can see where they’re coming from and I appreciate them so much. This cover totally SCREAMS HIDEO and I’m HERE FOR IT!!! I don’t know why I’m hyperventilating because it’s so simple and I don’t understand why I didn’t think about it in the first place, but I am. Hyperventilating I mean. Wake me up when we have a cover. Or on September 18. Because the wait will kill me if I think too much about how badly I want to read this book right now. GameOver would be AMAZING tho. IS IT MONDAY YET?? I WANT TO KNOW WHAT WE GET! Title? Official publication date?? Cover??? 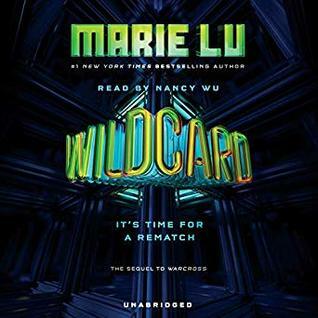 Wildcard represents the third series of Marie Lu's I've read to completion, and once again, I am amazed at her talent at building complex, compelling settings and creating characters you empathize with (as well as some you root against). Sure, sometimes the plots get a little bit technical or complicated, but at their core, Lu's books are about human connection, and we can all use a little more of that. "When the world is murky, guide yourself with your own steady li I'm between 4 and 4.5 stars. "When the world is murky, guide yourself with your own steady light." A lot has changed for Emika Chen in a short period of time. It seems like only yesterday she was on the verge of eviction from her NYC apartment, working as a bounty hunter to make ends meet. But when she accidentally hacked into the world-renowned Warcross Championships, she was summoned to Japan, where she became immersed in the virtual world of Warcross; became a celebrity in her own right; got to meet her childhood hero, Hideo Tanaka, who created Warcross; and found herself a target in a plot she didn't quite understand. 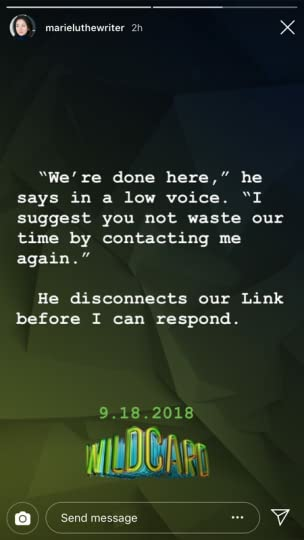 As her relationship with Hideo grew closer, she discovered that he was using the NeuroLink algorithm not just as a way for people to get information, and as a way to harness technology for good, but he was using it for nefarious (although understandable) purposes as well. The one person she trusted more than anything has betrayed her, she's being hunted down by assassins who want her dead for somehow affecting the last Warcross Championships, and she's being courted by the dangerous and mysterious Zero and his group of anarchists. Although Zero had proved a threat to Emika and her friends in the past, now he wants to partner with her to accomplish what she wants—to disable the NeuroLink algorithm, which now has countless citizens in its thrall. To do so, however, means crossing Hideo, and destroying what he has spent his life building. But how much can she trust Zero and his cohorts? What effect will her actions have on her life, Hideo, her friends, and the world? She discovers the truth to be a more tangled web than even she is able to solve, and she needs to figure out whom she can trust—fast. If you didn't read Warcross , the first book in this series (read my review), the above plot summary probably reads like Greek to you, but suffice it to say, this book is just as fascinating—and perhaps ultimately richer in emotion—than its predecessor. I've tried to keep the description fairly brief because there are a lot of twists and turns and double crosses, some I saw coming, some I didn't. Lu's talent first shows itself in her imagery, which is so evocative at times you can almost see the book playing itself out in your mind's eye. But as you get deeper into Wildcard you realize how well drawn the characters are, even those in supporting roles, like Emika's Warcross teammates, and you find yourself racing through the book, eager to know how things will unfold. This book didn't fully capture its predecessor's magic; there were times when the plot dragged a little or got a little too mired in complexity, but ultimately, Lu's storytelling drew me back in fairly quickly. I didn't realize this was the second of a two-book series until I was nearly done with it, which saved me from the usual dilemma of do I read it quickly or do I savor it, but I'm sad it's over, although I'm hoping Lu's next series will be related to this one. I know the subject matter will rule this book out for some, but if the story intrigues you, I'd encourage you to pick up Warcross first, and let yourself get immersed in this world Marie Lu has created. Hopefully you'll find it as compelling and crazy a ride as I did! I'll have to wait a few more days, so I really hope this book don't disappoint me. I'm already hurt from having to wait so damn long for this. Be good book, please be good. Okay, so I've been seeing not so great reviews for this and I'm oficially scared. Pls don't hurt me by being bad, book. PLEASE. Haven't even read the first book but I already want this too. It's just the Marie Lu effect on me: I always need more and more and more. This is such a disappointment. DNF. Warcross was one of my favorite books of last year, so i (obviously) had high hopes for Wildcard. but i was also really worried i'd be disappointed. spoiler alert: I HAD NOTHING TO FEAR (aka it was fantastic). all the things i loved about Warcross came through in the sequel, while also maintaining ~suspense~ and ~mystery~. Wildcard is definitely a darker book compared to Warcross, but it's one of the things that made me love it more. it felt like a "slytherin" type of novel (and the cover is green and black so!!!). 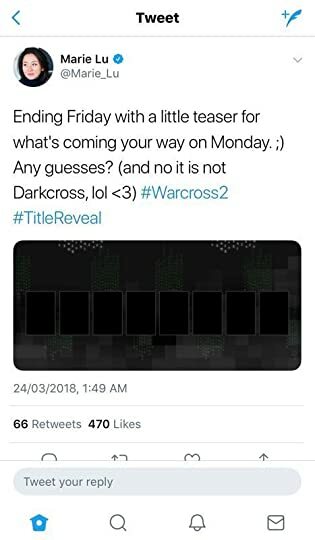 warning: spoilers for warcross!! if you haven't read the first book, don't read the review for the second book. we begin the novel almost directly after the end of Warcross. the big reveal makes us wonder who Zero really is and what's his story. naturally, he (and the rest of his gang) become a big part of Wildcard and I WAS HERE FOR THIS. their gang, the Blackcoats, are so ruthless and so cool. i mentioned earlier about how Wildcard is super ~dark~ but the Blackcoats are a big reason why. i loved all the new characters and their stories. although a lot of it is completely new, it ties together with Warcross really naturally. "Every locked door has a key. the parallels between Warcross and Wildcard!!!! i scream. i'm obsessed with authors who do little things with their series that tie it all together; MARIE LU PRESENTED IT WITH A BOW. i actually didn't fully realize until i went back to reread parts of Warcross, but UGH. i have a lot of feelings. but. i do wish i noticed these things the first time around. i feel like i would enjoy this duology so much more if i'd read both books in one sitting. regardless, i now officially prefer duologies to series/trilogies/standalones. they're so wonderful?? the one issue i have with Wildcard probably has more to do with myself than anything else. i forgot a lot of details in Warcross, which made me kind of confused while reading Wildcard. (duh) for example, a lot of the side characters and relationships were completely wiped from my brain (sorry, characters!). like i mentioned earlier, i think i would've enjoyed this book so much more if i'd read it immediately after finishing, instead of a year later. i know Mare Lu probably intended the reader to experience it that way, but she could've done a better job at refreshing my memory. (but i blame my memory!!! ugh) now i want to reread both books. the thing we, as readers, are most worried for is the ending of a series. personally, i was even more worried than usual because i felt UGH about Legend's ending and didn't bother reading The Young Elites' ending (both of Marie Lu's previous series). i love her books, but am usually frustrated at her endings – mostly because of what she does to characters. PROTECT MY KIDS PLS. 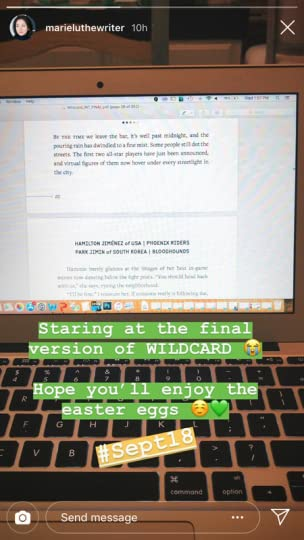 i don't want to spoil anything but WILDCARD IS A PERFECT CONCLUSION. it ends so cohesively!! it's so subtle and allows you to imagine a world for the characters beyond the pages!! i'm so happy with it, i could cry!!! in conclusion, Warcross/Wildcard is amazing. this is one of my favorite duologies. it's action-packed, carefully complex, and fast-paced; it's been a while since a read a book in one sitting and i couldn't put this one down. i'm in love with the world and how it seems too possible. i love all the characters and their relationships (and how they diversely represent different cultures and sexualities). i'm too obsessed. "But Emika soon learns that Zero isn't all that he seems--and his protection comes at a price."